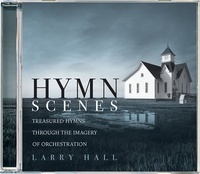 Hymn Scenes is a vivid instrumental collection of cherished hymns. These grand and expressive settings are arranged by Larry Hall and performed by the Kiev Symphony Orchestra. The drama and wonder of these familiar tunes is artfully displayed through the many colors of the orchestra. You may hear a sunrise in “More Love to Thee, O Christ,” a highland picnic in “Wonderful Words Of Life,’ the somber stillness of “It Is Well” or an Autumnal, New England panorama in “Praise Him, Praise Him.” Larry Hall shows us a new way to appreciate these wonderful hymns by giving us a vision of the truths they proclaim. This has to be one of the best orchestrations of some of my favorite hymns that I have ever heard.I love to listen to it in the morning as it refreshes the words to the hymns in my mind and gives me an inspirational start to my day focusing on Christ. Looking for a perfect Sunday morning CD? Or a great gift for a friend? Here's a fantastic recording of sacred music that is uplifting in every way. To God be the Glory! And I know there are a thousand versions of Amazing Grace out there ... but this is probably my favourite out there! Sounds of sweetness; music of delight; and wonderful ways to glory the Worthy Three In One. It's a sound that Christians will love to hear. We ought to be grateful for these sounds of joy because often we hear sounds of sorrow. But the truth that makes up these songs shows us that we can experience God's love but only in His Son. Treasure them, praise God for them, because He has blessed this wonderful music by His Son.